WEST WINDSOR – Mercer County Community College (MCCC) students enrolled in the American Honors program (AH@Mercer) presented innovative, thought-provoking projects at the conclusion of their spring semester, melding the old with the new in an intellectually-stimulating setting. Dozens of AH@Mercer students came together at the symposium to recognize the achievements of fellow students, and to honor the first class of AH@Mercer graduates. 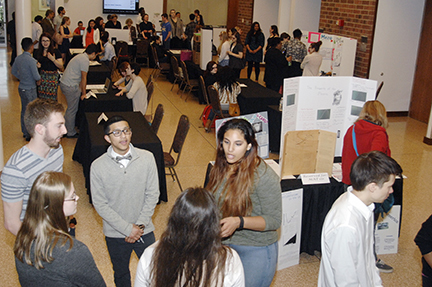 Students studying English, psychology, social science, organic chemistry, math and history presented their projects via table-top displays and interactive activities, many applying traditional solutions to modern problems; others applying modern solutions to age-old problems. “In literature we focus on love, but it is such a broad concept,” Colonna said. “A lot of stories have to do with relationships between people and you see the same themes over and over, but the concept of love keeps changing. Sociology Professor Denise Ingram’s class took on a class project looking at the sociology of drug use in America, with students taking on a different aspect of a comprehensive study. 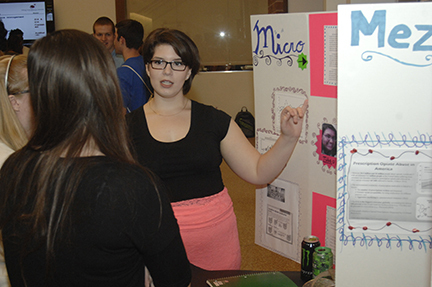 Student Brittany Mudri worked on the micro side, focusing on caffeine and energy drinks and how they are marketed to young adults. Other students took on the mezzo and macro aspects of the same topic. Mudri said she found that individual ingredients of energy drinks – such as caffeine, sugar, and various vitamin supplements – “have little or unknown side effects,” but combining them into a single beverage delivers an initial energy boost that actually diminishes with increased consumption. This, she said, is similar to the tolerance built up by those addicted to alcohol or illegal drugs, where users crave more and more of a substance to achieve the same effect. In his Honors Calculus project, student Brendon Pearsall took on a project addressing income inequality, utilizing a measure introduced in 2012 known as the Gatsby Curve. The curve plots intergenerational income elasticity – i.e., the likelihood that someone will inherit their parents' relative position of income level – and inequality in the United States and twelve other developed countries. Class instructor Richard Porter said this was a perfect example of how mathematics can be applied in practical situations. “I felt like this was the first time where math was really useful,” Pearsall said. American Honors at Mercer student Brittany Mudri discusses her research for an Honors Sociology course on drug use in America. 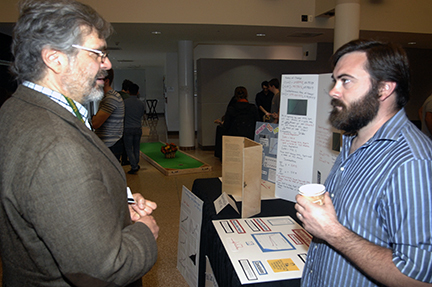 Mathematics Professor Richard Porter and student Brendon Pearsall, who performed an analysis of income inequality for his Honors Calculus project. Honors Organic Chemistry student Ron Trauger. 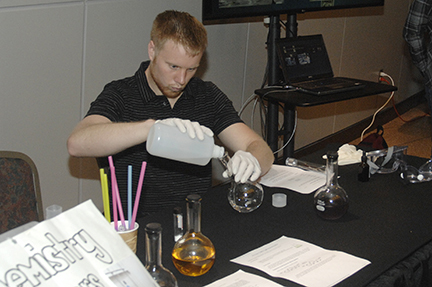 Dozens of MCCC students, faculty, and staff attended the American Honors at Mercer Honors Symposium May 13.